staff to submit photos to the weekly photo gallery. College of Arts and Sciences unleashes "This Week in Pictures"
TAMPA, Fla.--The College of Arts and Sciences (CAS) will be accepting and publishing photographs weekly, submitted by USF faculty, staff and students that capture campus life, class projects, research, faculty and anything else showcasing CAS. 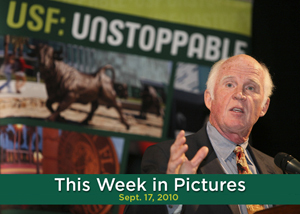 "This Week in Pictures" will capture the moments that may be left unseen to a majority of the student body. The whole process only takes a few shots and a few clicks. You must have the right to distribute the photograph and give CAS proper authority to use your photograph. Photos may be submitted while events are occurring or once they are finished; however all photos must be submitted by 3 p.m. every Friday to be considered for the gallery. Submitted photos will be reviewed by the CAS communications and marketing office and will use photographs at their discretion. This initiative's purpose is to get faculty, staff and students involved and in-the-know about their college as well as providing a sense of environment for prospective students.